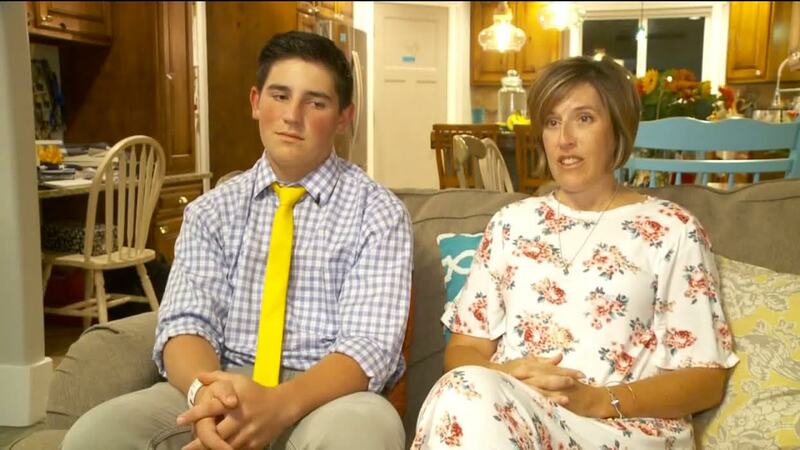 OREM, Utah (KSTU) -- A young football player from Orem who recently underwent surgery is getting recognition online after he rose from a wheelchair and struggled to stand during the national anthem at Friday night's game. Riley Jensen, whose Twitter bio lists him as a member of Alta High School's coaching staff, posted a couple of photos of a player on the opposing side Friday night during the national anthem. Jensen said he didn't know the individual, but tweeted "impressive effort young man." The photos show #65 bracing himself with one arm and leaning slightly on a wheelchair as he stands with several others on the sidelines during "The Star Spangled Banner." That young man was 16-year-old Carson Geddes, a junior at Orem High School who plays defensive end for the Tigers. Carson told Fox 13 News he wasn't feeling his best after the recent surgery, but he wanted to be there at the game to support his team. He said when he heard the anthem begin, he felt he should stand. "Standing up was a little hard, so I had to lean on my wheelchair a little bit, definitely wasn't feeling too good by the end of the song," he said. "It was hurting pretty bad that night, right after surgery, so I didn't feel too good. But I felt like I just should stand up, like that was the right thing to do." Carson said he went in for surgery to treat a hernia on his left side, but when the doctors opened him up they discovered he had a second hernia on his right side as well. Doctors fixed both during the surgery. He said despite the pain, he wanted to show his support for his country. "I'm really patriotic.... that's probably the main reason, just because I love my country and I really respect the people who fight to keep our country the way it is, and for our flag, so it's just out of respect for those people," he said. "I just felt, it's just what I do." Carson's mom, Liesha, said she and Carson's dad wanted him to stay home and rest, but Carson was insistent. "We didn't think he should go, we thought he should stay home and convalesce and rest because it was so close to his surgery, but he was insistent and really wanted to be there," she said. Carson says doctors tell him the recovery time for the surgery he underwent is between 4-6 weeks. Geddes said her son's actions weren't a surprise, and she said they are proud of him. "He's very, very patriotic, he wants to be in the military after he graduates and serves a mission for our church," she said. "And he is very passionate, he loves politics and he loves his country, so, we weren't surprised." The teen's effort to stand for the national anthem comes as several prominent athletes, most notably San Francisco's Colin Kaepernick, have taken a knee or sat during the national anthem as an act of protest. Carson spoke about those protests. "A lot of people think it's because I'm trying to send a message to players like Colin Kaepernick and his teammates that also don't stand for the flag, it's not any of that, they have their rights," he said. "I just hope that people recognize patriotism a little bit more now, and what it means, and what the flag stands for, and the people who defend it." Doug Cartwright, an assistant football coach at Alta, also tweeted about the moment. That tweet has been liked and shared thousands of times. According to MaxPreps, Alta beat Orem 47-28 in Friday night's game.